I was in a funk for a good two weeks in late September. It was a regular grumpy-annoyed-wake-up-in-a-bad-mood kind of funk. Maybe you've been in one before? There were a couple legitimate reasons for my funk---more law school disappointments, Adam traveling, living under the grad school mantle of unending reading and study-guilt---but in addition I also had a bad attitude. Eventually I got plain tired of myself and my bad mood, so I decided to make some changes. Now, I'm happy to say that I am out of that funk. The law school disappointments are still there. Adam still travels, and the unending reading and study-guilt aren't going anywhere, but my attitude is better, and that has made a HUGE difference. There's probably something to be said for just riding out a funk---experiencing it and trusting that it will end and that you'll emerge at the other side just fine. However, I also think it's important to develop healthy habits---ones that make us better and happier people in general and maybe even help avoid future funks. I initiated several changes that helped me get out of my funk, and in the hope that they might be helpful to some of you, I've decided to share them here. I must also note that these are based on my experience only. I am in no way qualified to give any kind of advice, and these tips are not meant to help anyone with severe depression or anxiety. So, along with some apple "nachos" today I bring you…. This one was really important for me. Going too long with inadequate sleep made me grumpy and emotional, so I knew that I needed to improve my sleep habits. I got more sleep by (1) setting a firm bedtime (2) limiting screen time before bed, and (3) doing relaxing routines. It's so hard to turn those screens away, I know, but I began a no-screens-30-minutes-before-bed rule and it made a big difference. I also started using essential oils to help me relax and fall asleep. Call me crazy, but I think they helped. I used this one but I've heard good things about this expensive kind too. I rubbed it on my wrists and sometimes the bottoms of my feet. It made me smell like a spa (Adam said a rainforest??) and I loved it. I set a goal of only checking Instagram and Facebook once a day. This change has been by far the hardest, and it's still something that I struggle with on most days. However, the simple act of being more cognizant and purposeful about the time I spend on social media has made a big improvement on my attitude. The truth is, scrolling through social media has a tendency to make me feel jealous and inadequate on good days. Those feelings were compounded when I was in a funk. 3. Reach out to friends. Sometimes when I'm feeling a little down or just plain overwhelmed with work, I tend to isolate myself. This is no way to get out of a funk. I realized that I needed to reach out to my friends. I called or emailed the ones that live far away. I set up study dates or lunch dates with friends close by, and had a good laugh (and cry) with some of my best friends over dinner. Though sometimes I had to push myself out to reach out to my friends, it always, always brightened my mood. When you're in a funk, the littlest things can set you off. I set a goal of making mornings happier. For me, that meant having a healthy breakfast ready to go, packing my lunch the night before, and listening to music while I got ready. Starting my day off in a good mood made it more likely to last the whole day. 5. Add inspiration to the mundane. What little tasks make up the mundane parts of the day are different for different people, but for me, driving is mundane. It's routine, unexciting, and if I hit traffic or get stuck behind a slow car, it will further my funk. To change this, I downloaded an inspirational audio book on my phone and listened to it as I drove. I loved the book so much that I even started looking forward to time in the car. Listening audio books regularly would be expensive, so now I've been mixing it up with podcasts as well. Since part of my funk came from being overwhelmed with school work, I wanted to change my daily outlook on my to-do lists. My to-do lists were forever long, and I was never checking everything off. It made me feel like a failure. My new planner helped immensely with this. Every day has a "Top Three Section" along with another area for a daily to-do list. Everyday I would write down three important but doable tasks that needed to get done. Prioritizing and completing those three tasks made me feel accomplished, and if I didn't finish the other items on my to-do list, I just moved them over to the next day. My planner also has a gratitude box for each day, which helped me focus on the positive even when I felt like I didn't get enough done. Experiencing something bigger than ourselves connects us to the world we live in and our place in it. Spirituality means different things to different people. For me, it meant making time to attend daily mass at least once a week. It made me feel grounded and helped me keep my problems in perspective. Yes, research shows that smiling more can actually make you happier. Some days I would get bummed out at law school because it seemed like most people didn't smile at me as they walked by. I think we women also often wrongly interpret others' glances or stares as judgment or criticism when they're not. So, anytime I walked by someone in the hallway and made eye contact, I smiled, and anytime I caught someone staring at me from across the room, I smiled. People maaaaaay think I'm crazy, but that's ok. It made me happier, and at least half of the people that I smiled at smiled back. 9. Feel someone else's heartbeat. One of my biggest hurdles in achieving #1 was that I had a hard time falling asleep. I would lay down at night and feel my heart beating loud and fast. When I talked to my doctor about it, she said that it was common for women and suggested a couple natural sleep aids. She also said something that especially resonated with me: "While you're in bed, reach over to your partner and feel his heartbeat. It will calm you down and help you fall asleep." Although this information was only mildly helpful for me, as most of my sleeping issues happened when Adam was away, I loved the idea.When you're stuck in a funk, or just feeling anxious, or bummed out, or overwhelmed, feel someone else's heartbeat. Think about the pulse of a life other than your own. Being in a funk is really just feeling weighed down with the particular stresses and burdens that you're carrying and allowing your brain to warp them to be larger or more important than they actually are. Thinking of someone else can take your mind out of that trap. Finally, apple nachos! 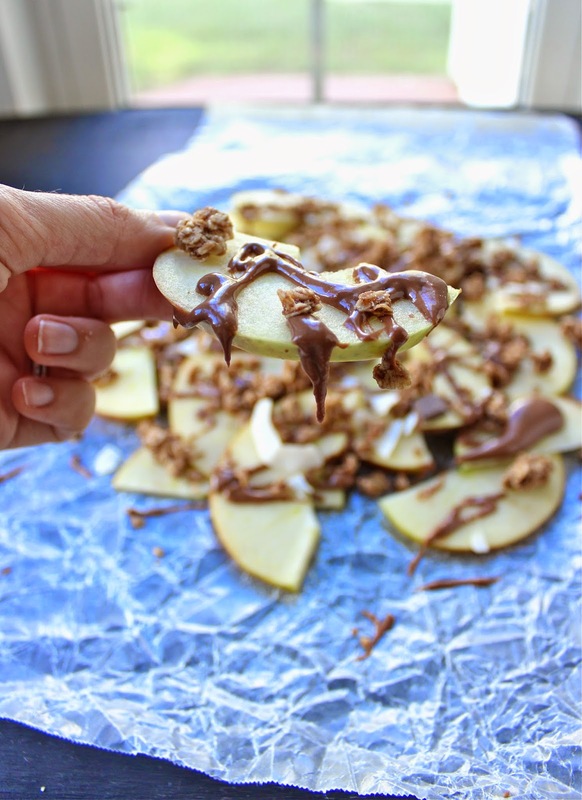 Apple nachos have been all over food blogs and Pinterest, but all the ones I've seen have been loaded down with caramel candies, snickers or chocolate chips. While all those things are good, they don't necessarily equal a healthy apple snack, which is what I think apple nachos should be. 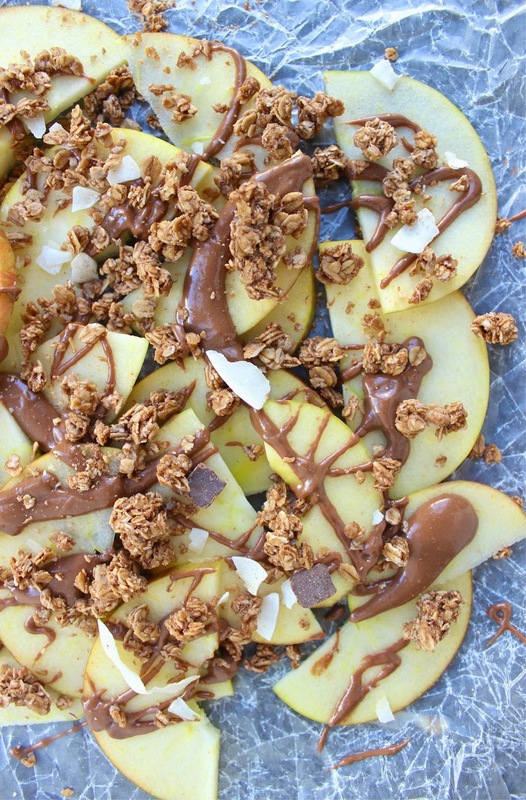 These apple nachos are made with melted peanut butter (and just a little Nutella) and chocolate granola. 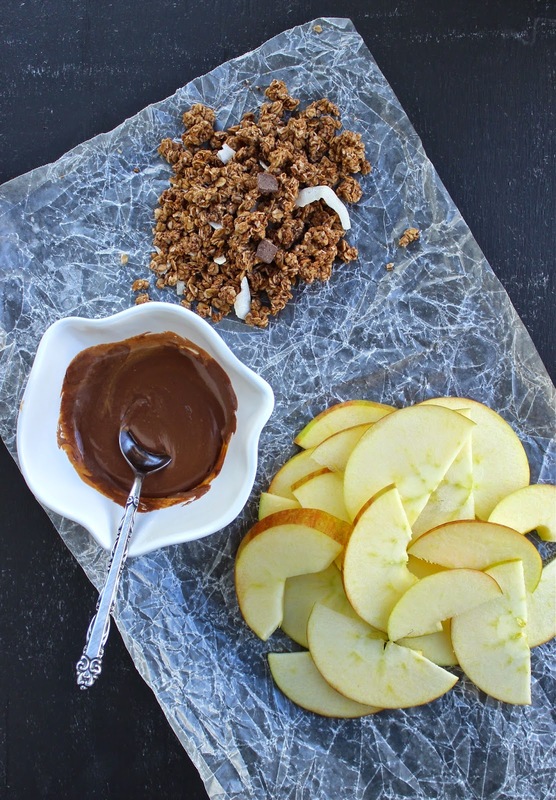 It's a wholesome treat that you could serve as a fun dessert or snack. Kids would love it! You can use store bought granola, as I did here, or be really awesome and make your own. 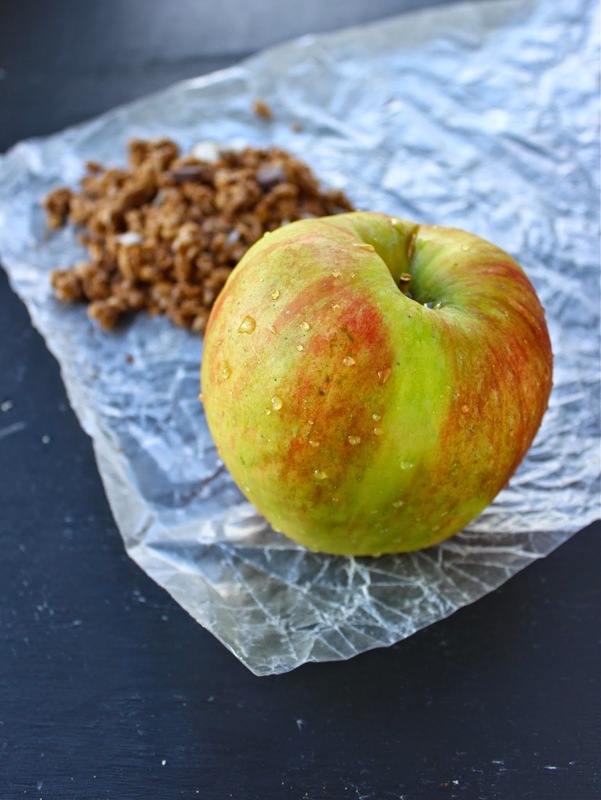 Slice the apple thinly and arrange in a layer on a plate or prepared surface. In a small microwave safe bowl, combine the peanut butter and Nutella. Microwave for 15 seconds and stir vigorously. Microwave for another 10-15 seconds and stir until smooth. 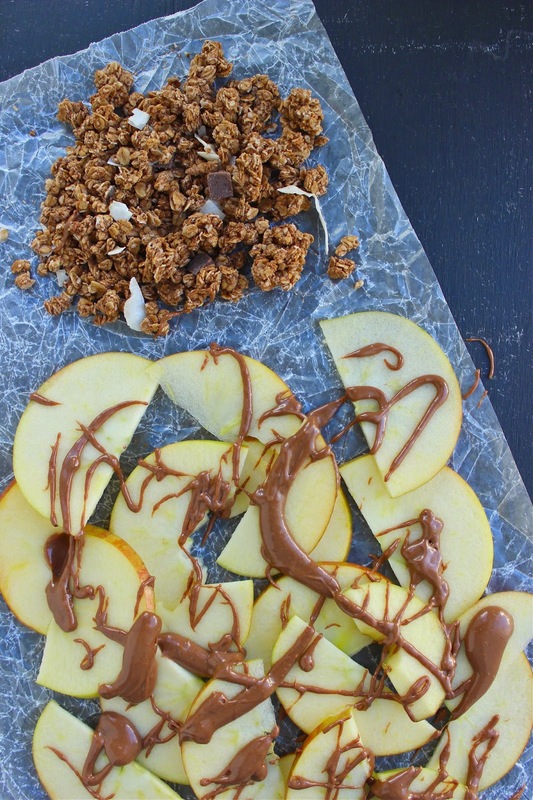 Drizzle chocolate peanut butter mixture over apples. Sprinkle with granola. This is awesome advice and came at a great time (I'm in my own funk right now). These 'nachos' look awesome and I'm with you on the unhealthy Pinterest versions... I couldn't justify them. The granola on these is a genius idea and anything chocolate + PB is perfection! I didn't know I needed these in my life until this post! Looks amazing!!! I've been in funks like the one you described and it is NOT fun. Hang in there girl! Having these nachos as an after work snack would totally make my day!